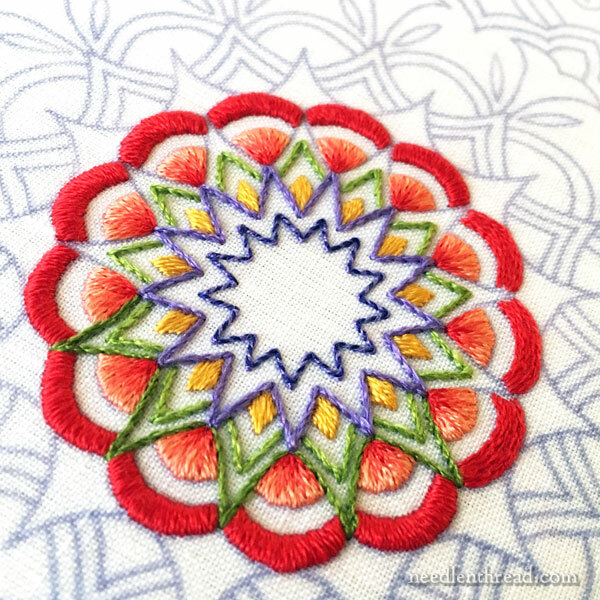 For those of you eager to stitch your own embroidered kaleidoscope, whether you’re using designs from Favorite Kaleidoscopes which I launched last week or using your own drawings, I’m going to share the whole process of Tulips Festival – an embroidered kaleidoscope – with you in short series of articles here on Needle ‘n Thread. Even if you might not be into stitching these types of blossoming, repetitive designs, that’s ok! I’m hoping you’ll still find a little inspiration and plenty of tips for your own projects, no matter what they may be! So, today, the first part of Tulip Festival – Getting Started! 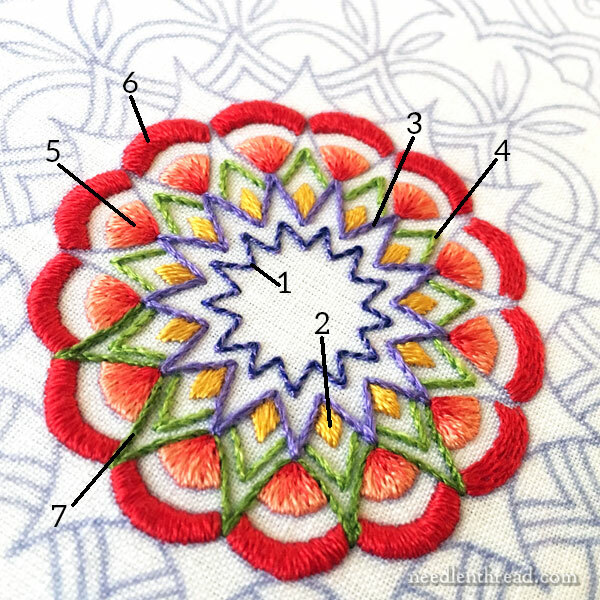 We’ll talk about the fabric and threads I used in my interpretation of the project, how I set the project up, and we’ll cover the first inner circles of stitches used on the design. Tulip Festival is a rather exciting kaleidoscope to embroider, because of the way it blossoms outward in layers and layers of design and color. For my interpretation, I used linen as the ground fabric and silk to embroider the design. I swear – I really do! – that the pleasure I had in stitching this particular project came not just from the excitement of seeing the thing unfold in color and stitches, but also in the whole feel of stitching on Really Good fabric, with Really Good threads! That said, if linen and silk aren’t your thing, no worries! You can substitute fabric, threads, colors. I thoroughly encourage you to experiment, to work with what gives you pleasure, to play with fibers, colors, threads, fabrics – that’s the fun of these designs! My interpretation involved the following materials and tools. You’ll find resources at the end of the article if you’re looking for the same materials. I used linen cambric by Legacy linen, which is a very fine, sheer linen. I backed it with a good quality white cotton muslin. Why cambric? Two reasons: I wanted a high count, fine linen. And at first, I planned to trace the design, which is always easier on a sheerer fabric. But then I decided not to trace the design. I already had the linen cut, so I went with it anyway. Because the linen was so sheer and light, it was Absolutely Essential to back it with cotton muslin. I use Southern Belle cotton muslin, but any good quality white cotton muslin will do. Legacy Linen’s Alba Maxima could easily be substituted and wouldn’t require a backing fabric. The whole project is embroidered with Soie d’Alger stranded silk. There ain’t nuthin’ like it! Hoop: 8.5″ round (the pattern is 7.5″ round, so you might choose a larger hoop if you like a little more space around your design). The inner ring of my hoop is bound with twill tape. You can find a tutorial for binding a hoop here. A floor stand that will hold a hoop, or a sit-on hoop stand like this one, if you want to have both hands free to stitch. 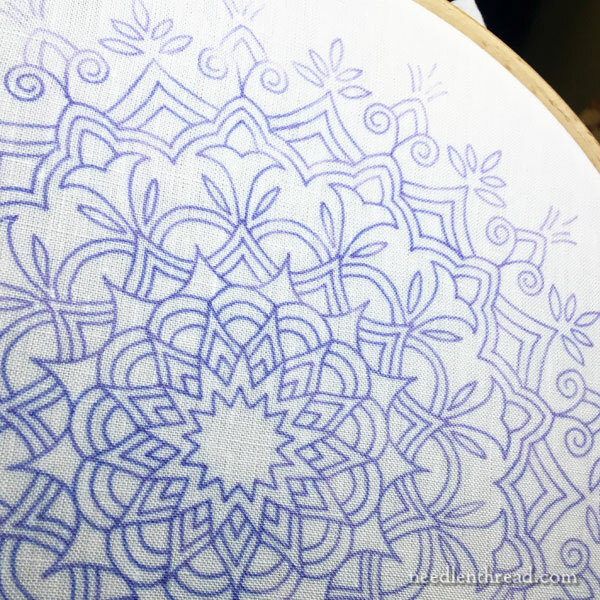 Transfer Pen – I used Sublime Stitching’s fine tipped iron-on transfer pen, which I reviewed here. I used the blue. These things are good!! You should definitely have at least one in your arsenal! If you plan to wash your piece after finishing it, and you’re using linen or cotton, you should pre-shrink your ground fabric. With linen, I usually soak it in hot and cold water repeatedly (three times back and forth), ending with hot water that I let it sit in until the water is cool. Then I roll it in a towel, and, if I’m not going to get to ironing it that day, I pop it in the freezer. That way, when I iron it, it’s still damp, and it irons beautifully using the linen setting on the iron. If I’m using a cotton backing, I do them both at the same time. If you don’t plan to wash the project, I suppose you can skip pre-shrinking your ground fabric. I cut the linen and backing fabric to about 14″ square. You can get away with about 12.5 / 13″ square and it will work fine in a 8.5″ hoop. However, if you want plenty of room for finishing, then I’d go larger rather than smaller. Once the linen is ironed and completely dry, I transferred the design using the instructions for transferring with the iron-on transfer pen. I hooped it up, and I was ready to go! I gathered all my silk threads, my scissors and needles, situated myself under a good light, and got started! I worked from the inside of the design outwards, so that my hands weren’t passing over previously stitched layers too frequently. Technically, they could stand on their own as a pretty little round design, couldn’t they? Maybe a Christmas ornament? In the photo below, I’ve numbered the layers in order of stitching and then listed the stitches used, the colors of thread, and the numbers of strands, with links to tutorials or tips for the particular stitches. 1. Whipped backstitch: backstitch foundation in two strands of 1336, whipped with one strand of 1334. You can find a video tutorial for whipped backstitch here. 2. Padded satin stitch: one strand of bright gold 2525 for split stitch foundation and horizontal padding stitches; one strand for top layer of satin stitch. You can find all kinds of tips and tutorials for satin stitch listed in this article. This particular tutorial on satin stitching to a sharp point is exactly the technique I used for this element. 3. Stem stitch in two strands of 1335 (medium blue). You’ll find a stem stitch video tutorial here. This tutorial on stem stitching on sharp corners will also come in handy. 5. Long & short stitch in one strand each of 922, 924, and 925, from light on the outer to darkest on the inner part of the design. A split stitch line was worked in 922 in one strand along the design line, and the long and short stitch worked over it. You’ll find video tutorials for long & short stitch here. This particular tutorial on shading at an angle with long and short stitch will come in handy. 6. Padded satin stitch in 926. I used one strand to split stitch along the design lines. I worked close rows of stem stitch between the two design lines for padding using one strand of floss. I satin stitched over the padding and split stitch outline in one strand, working perpendicular to the padding. 7. Stem stitch using two strands of 2126 (darkest green). Tulip Festival is one of the many kaleidoscope embroidery patterns included in my e-book Favorite Kaleidoscopes, which is available here for download from my shop. You can find all the same materials I used to stitch Tulip Festival – hoop, linen, threads – from Needle in a Haystack online. You can find the fine-tipped iron-on transfer pen from Sublime Stitching, here. I like the blue. 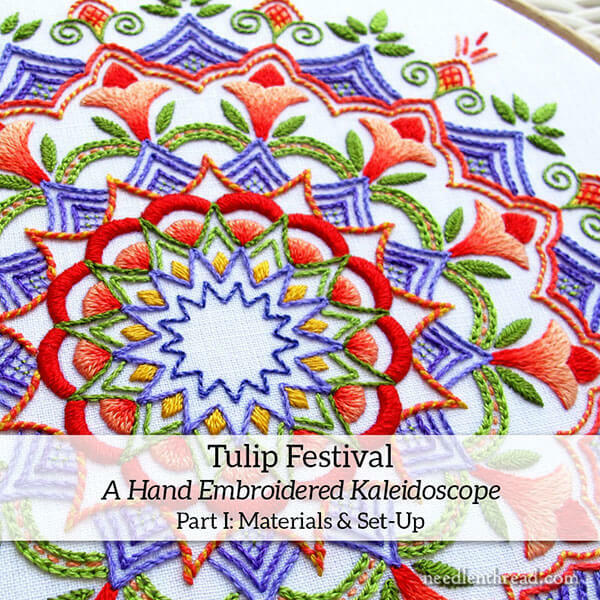 We’ll cover the rest of Tulip Festival in a couple more chunks, and then I’ll gather all the articles together in one index for you to find it easily when you’re ready to stitch! OK, I am sold! I will follow your materials advice and place some orders today. I anticipate starting this over Thanksgiving as I took the week off. Looking forward to this. I tend to be a lurker and it is time I get my feet wet more. PS…I even threw in Octoberfest! Thanks so much, Robert! I think you will love stitching both of them! I haven’t framed Tulip Festival yet, but I plan to. It’s my favorite! Mary, where do you get the Sublime Stitching pen? Hi, Jeanette – Sorry about that – I linked to my review of the pens in the article above. There’s a link at the end of the review. But here it is: https://sublimestitching.com/products/transfer-pen And I’ll put it in the article, too! Mary, how do you get your lines to look sooooo perfect on the fabric, without a wobble or a slight overlap? I always seem to wobble even when I’m being extra careful. Your design looks absolutely perfect!!!! If it helps, I was instructed to not look where your pen point is, but to look where you are drawing your line to. Your hand will follow where your eye goes. Your lines will come out straighter and meet where you want them too. Try it on some scrape paper first. This also works when you are sewing certain lines and seams on a sewing machine as well. What a lovely design the Tulip Festival is and all my favourite threads I really like Soie d’Alger silk threads they are my favourite go to threads and I really like the various stitches you have used on the design and of course linen especially Legacy wonderful. It really looks bright and cherie. Thanks for sharing your instructions on the Tulip Festival project with us and how to set up the design. I’m looking forward to the next article on this design. Thank you Mary, this is going to be a fabulous resource. Hi, I’m from Costa Rica, the Tulip embroidery festival can be embroidered with DMC thread mouline special 25, in my country they only sell DMC # 5, # 25 and few colors # 12, greetings and thanks, my great teacher. Hello, Rosa – yes, you can substitute any thread you wish! However, 6-stranded cotton (mouline Special 25) would work best if using cotton. Thank you for posting this. It’s just amazing. I haven’t learned some of the stitches, what a great opportunity. I can’t wait to stitch this but I cannot work with silk, I’m allergic! Tragic, I know. 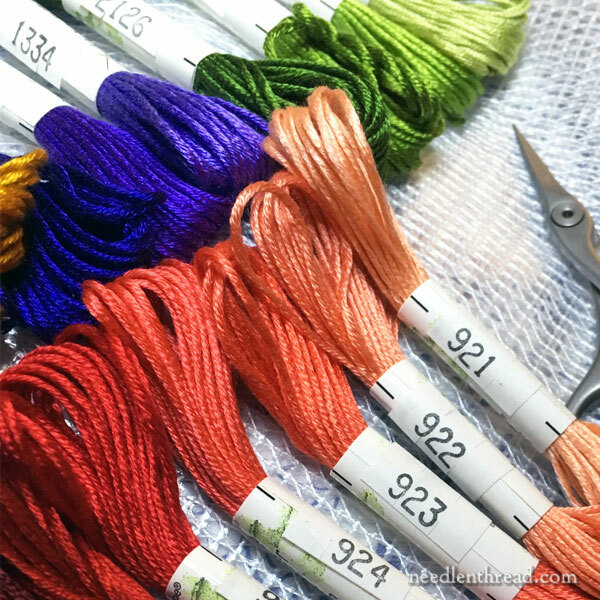 Would it be possible for you to list the color names or corresponding DMC floss numbers so that those of us not able to use silk can still stitch this? Thank you! If you’re unsure of it, you should definitely test it first. You can also trace with pencil if you’re using a light fabric, with either a light box or a sunny window. If you’re working on cotton or linen, you can spray starch the fabric first and that will help release the pencil when finished, if you plan to rinse it. You mentioned using a backing fabric. Can you tell me how you set it up? Do you baste it to the working fabric or just put it in the hoop with it? I have Kaleidoscope collection and the Octoberfest pattern and am looking forward to getting started! Hi, Dot – Well, if I’m using a hoop or stretcher bars, I just stick it all in at once. So, in this order: inside hoop ring, backing fabric on top of it, ground fabric on top of that, outside hoop ring. I keep the outside hoop ring fairly tight – just loose enough that I can push it onto the fabrics and bottom ring, and it will do a good job on its own of pulling the fabric uniformly taut at first. Then, I turn the hoop over and, pushing with my thumbs on the hoop and pulling with my fingers, I work around the hoop, pulling the fabric evenly taut a little more, and making sure there are no wrinkles in the backing fabric. Then I turn it over and check the front and do the same thing, tightening the screw between tightening the fabric. Finally, when I’m good and satisfied that the fabric is taut, I tighten the screw one final time, using a screw driver. My name is Marcia and I’am from Brasil. I wish I could have in loco classes with you! I love your work. I learnt to do some work seeing your you tube videos. I’m your follower since…. yesterday! But I must write to you, because I’m very impressed of your high quality blog. You are and artist! And very generous hostess, sharing your knowledge and tips in such easy to follow instructions. 🙂 Thanks, Maria! I’m glad you like my little website!! Previous Previous post: Why Switch Embroidery Needles?